• Hot Water Injection: Too Dry? Make it wet! • Hot Soap Injection: YES! Soap works! All in all it is clear that Dry Vapor Steam Cleaners are superior in MANY areas over wet steam. There is no question that a quality dry steam cleaner is incredibly diverse in its potential uses. Our Italian made true heavy duty Commercial steam cleaners are second to none. If you are in the auto detail business or want to offer a mobile dry car wash service and do not own a dry vapor steam cleaner you are missing out. Same goes for those of you offering cleaning services or that are working in the Janitorial field. Once you work with steam inside of a car, bathroom, kitchen, you will never want to work without one again. Yes, they are that good! Vapor Rino makes the decision easy. Other units have few to no features, no or low quality accessories and can cost from $4,000 to $7,000. Our units start at just over $1k on up to about $3k. When you combine our unique features, powerful accessories AND Quality you see the clear winner. We hope you are excited. 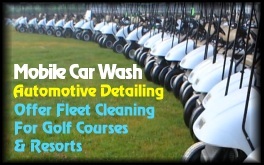 This year is shaping up to be a GREAT year for the automotive detail and car wash industry. Gas prices are down and there is a buzz in the air. Get your Vapor Rino unit today and get geared up for a good year! If you have any questions, please, contact us by E-mail or give us a call. We will be happy to answer your questions. Check out our contact page here. 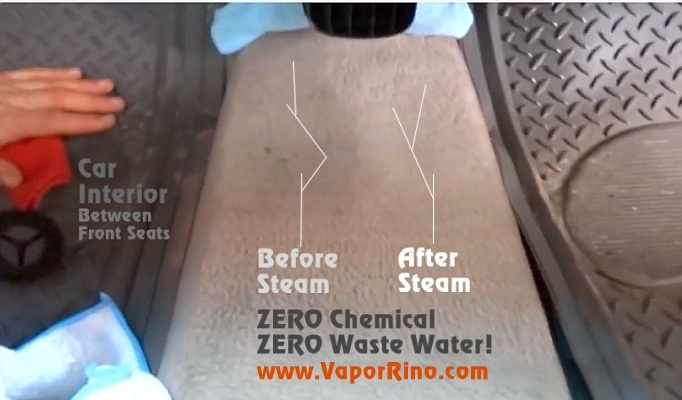 You can actually use one of our Vapor Rino Industrial Steam Cleaner safely in your home or office. Of course, this means you can use it in your shop, detail center or even wash cars inside of a parking garage! Perfect for sanitizing surfaces, cleaning grout, greasy commercial kitchens, bathrooms and more. Makes a great 100% environmentally friendly janitorial or automotive detail tool. Our 120V Vapor Rino Commercial dry vapor Steam Cleaners use about 1 gallon of water for a full hour of non stop dry steaming! This means you don't need access to any large water supply. Just bring a couple of gallons of water with you and you are all set for the day. This feature makes Vapor Rino Dry Vapor systems ultra portable! Perfect for avoiding fines from local government in regards to commercial water usage! Yes, you heard that right. When used correctly you will have ZERO water runoff and ZERO water waste! Our commercial vapor steam cleaner is second to none. Ultra environmentally friendly and most importantly, they work! Our systems are so dry that when used right, there is no water that hits the ground when washing a car or cleaning a sink or toilet for that matter. This means you will have NO water to recycle. No more expensive water reclamation equipment, no more evaporative run off pits, no more fines! This give your company a major edge when it comes to EPA and local environmental regulations. No hassles are good hassles! Of course, if water is not an issue at your location, fire up the steamers hot water injection for faster cleaning! More below. Our commercial dry steam cleaner systems are light weight and most work on a standard household outlet. Most importantly, they do not require large supplies of water! This makes these systems EXTRA Mobile! Just bring a couple of gallons of water with you and you are good to go. Our professional dry vapor steam cleaners actually sanitize while you clean! You can use them for PEST CONTROL in the areas of Bed Bug removal. You can Kill Bed Bugs, flees, lice, scabies, viruses, bacteria and more ON CONTACT. Help stop the spread of disease, kill pests all without soaking your carpets or furniture. Are you an Auto Detailer? If so, tell your customers you can sanitize the car as you clean it! Problems with flees, lice, dust mites, mold and other biological contaminates? 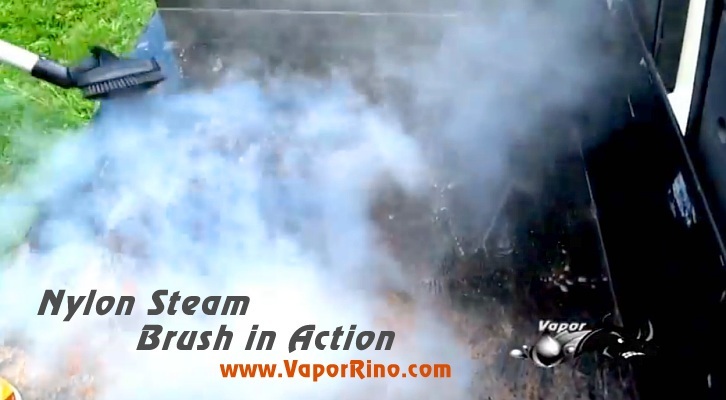 No problem with a Vapor Rino Professional Vapor Steam Cleaner. When done right, steam kills on contact! Our fully mobile sanitizing, Janitorial auto detailing commercial steam cleaners range in price from a over $1,000 to just under $3,000! High quality, Italian made true commercial vapor steam cleaners. Many other systems on the market range from 4 to $7,000. 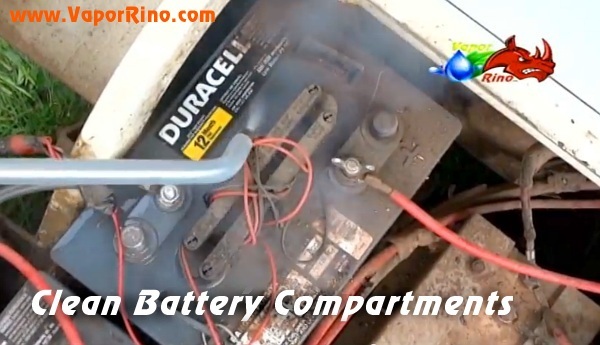 Vapor Rino's are priced to sell and are highest powered all electric units on the market. The amazing thing about our portable, commercial grade dry vapor steam cleaners is how easy it makes for even just one person to open a cleaning service, automotive detailing service and even a mobile car wash. The second thing is how affordable our exclusive units are. For a small fraction of what it would cost to start a traditional car wash the lone wolf can break into the business fast. The learning curve is almost none, the investment in cash is very very low and you can take your car wash, automotive detail or cleaning/Janitorial service to your customers. You can even wash their car inside the home owners garage and offer in office cleaning even during work hours. You just need a Vapor Rino steam cleaner, a pile of micro fiber towels, some basic hand tools (like sponges, rags, spray cleaners) and some determinations to get started. A Vapor Rino Steam Cleaner is the perfect add-on to your existing cleaning service, janitorial service, house keeping service, carwash or detail business. 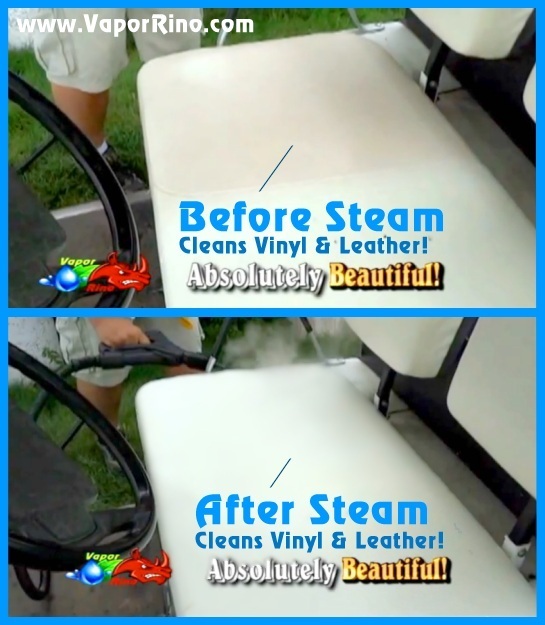 Commercial steam cleaners DOMINATE the detailing world! There is NOTHING else on the market that comes even close to what steam can do for your business. 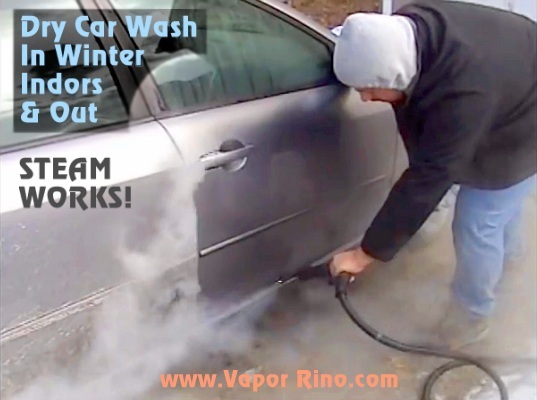 Ask any automotive detailer that has used vapor steam. The fact is that DRY vapor steam is not as fast as WET steam when it comes to OUTDOOR work. Why? Wet steam has 70 times more water. This gives it more rinsing power. (see wet steamers) However, for the most part our WET systems are not indoor compatible unless your facility is equipped with floor drains. For the stationary car wash, wet steam rules. For the mobile car wash or interior detailer Dry steam rules. 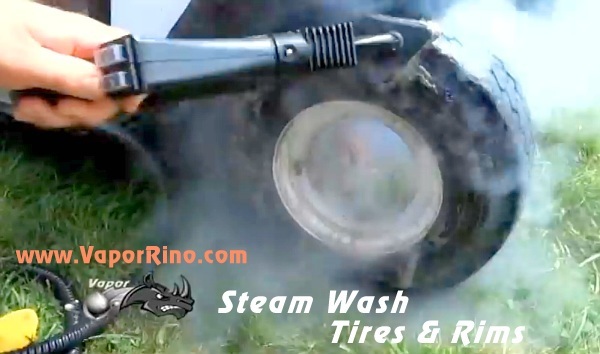 With that, Vapor Rino Dry steam cleaners are MUCH more versatile than wet. That being said, DRY Car washing is a pretty rapid process. Unlike other methods, you actually accomplish two steps in one. By doing your final dry wipe down at the same time as you are doing the wash you save time! Our 120V systems do a great job and our 230V do EVERYTHING even faster. When combined with the hot water injection systems that most of our units have, you can wash a car fairly rapidly. Don't forget, you are sanitizing at the same time as you clean! Also remember that our unique selection of high quality, specialty attachments make for fast & efficient cleaning in a variety of environments. Versatility is what sets a dry commercial steam cleaner apart from a wet steam system. You can use our systems on automotive carpets, upholstery, leather, vinyl, plastic, glass and of course the whole outside of the car. 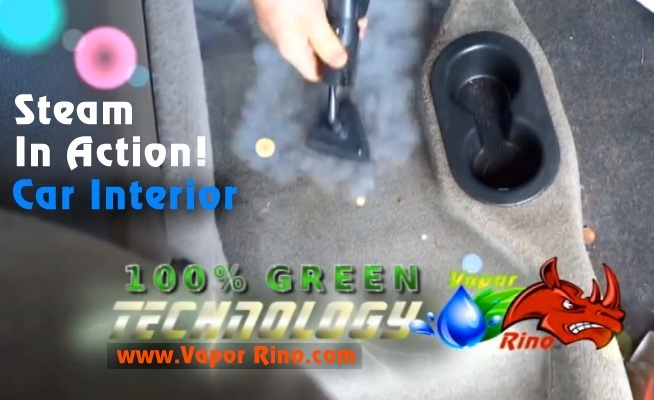 Vapor steam cleaners are outstanding in the automotive detailing business! This same principle applies for indoor use. 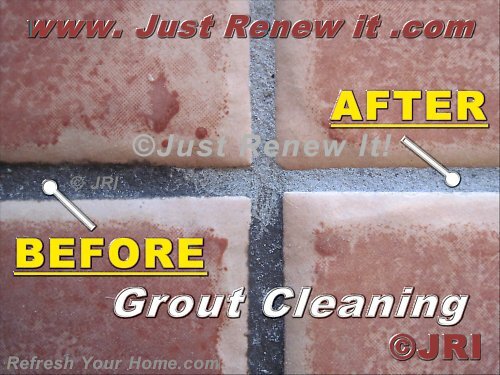 Perfect for your cleaning tile in your kitchen, bathroom, dusting & cleaning the whole house. 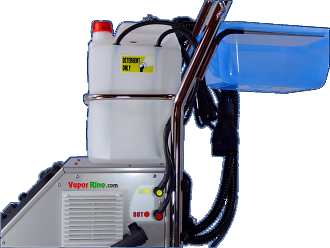 Don't forget, a Vapor Rino commercial steam cleaner can be used to kill BEDBUGS, lice, flees, scabies, dust mites and more on contact. Our systems are second to none in this area. 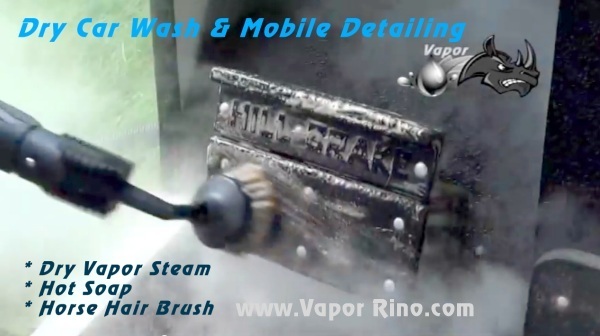 Another very impressive feature of Vapor Rino systems is our exclusive Dry Vapor Steam Cleaners many accessories. All of our dry systems come with a full set of accessories (see individual product pages for details on each unit). Use the horse hair brushes for delicate work like fabrics and painted surfaces. Use the brass, stainless steel or nylon brushes for thing like rusty metal, BBQ grills, tile and grout cleaning, spot cleaning and more. Use the window squeegee for cleaning glass and mirrors. Don't forget the included steam mop head! There are many more accessories that come with our units. See product pages for specific accessories or see our easy replacement accessories page to see what is available. Order replacements anytime! Again, this dry vapor steam has just enough moisture in it to do the work but dry enough for indoor use! This dry steam allows you to use our units in low water environments. It also allow you to use them on fabrics and carpets without getting them wet. Most often, the surface treated is dry within a few minutes. Most of our units feature hot water injection on demand. Many times you will find a little extra super heated water in the steam flow is what it takes to get a surface clean! With most of our systems this feature is just a push of a button away! Awesome for increasing the speed of your car wash or janitorial cleaning service. Ideal for those stubborn stains inside the car. DO NOT BUY a steamer without hot water or hot soap injection. Most of our units now feature HOT Soap injection! YES HOT SOAP! This feature is amazing when used right. Perfect for using 'no rinse' car wash fluids, car soaps or for degreasing engines. Hot soap injection is another must have for the serious auto detailer or mobile car wash professional. If you are going to be working in the cleaning industry such as house keeping or janitorial services you really should get a hot soap or at least a hot water injected system. Perfect for sanitizing bathrooms, de-funking deep firers and so on. A little soap can go a long way! Vapor Rino has you covered.
" Hot Water Injection: Too Dry? Make it wet!
" 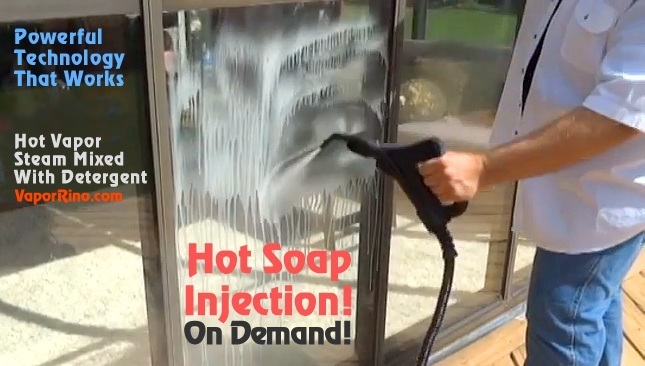 Hot Soap Injection: YES! Soap works! are superior in MANY areas over wet steam. work without one again. Yes, they are that good! accessories and can cost from $4,000 to $7,000. Our units start at just over $1k on up to about $3k. accessories AND Quality you see the clear winner. today and get geared up for a good year! your questions. Check out our contact page here. government in regards to commercial water usage! friendly and most importantly, they work! at your location, fire up the hot water injection for faster cleaning! More below. standard household outlet. Most importantly, they do not require large supplies of water! Commercial Steam Cleaner. When done right, steam kills on contact! priced to sell and are highest powered all electric units on the market. specialty attachments make for fast & efficient cleaning in a variety of environments. Versatility is what sets a dry commercial steam cleaner apart from a wet steam system. dust mites and more on contact. Our systems are second to none in this area. see what is available. Order replacements anytime! surface treated is dry within a few minutes. the car. 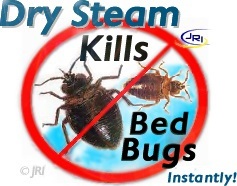 DO NOT BUY a steamer without hot water or hot soap injection. deep firers and so on. A little soap can go a long way! Vapor Rino has you covered. without one again. Yes, they are that good! to answer your questions. Check out our contact page here.